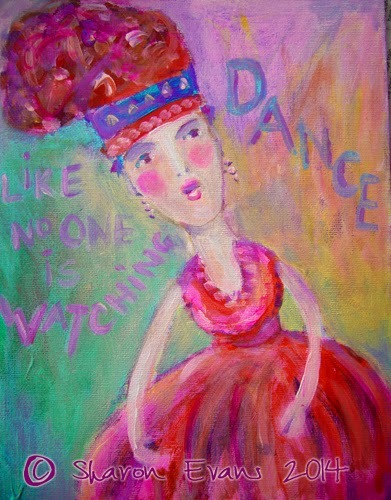 For my Painting No 1 of Leslie Saeta’s 30 Paintings inJanuary 2014 I have chosen to dance the New Year in. The painting is acrylic, on a canvas panel 8x10 inches. Looking through my files the subject of dancing appears often as inspiration for my art. It is strange as I hate dancing, well let’s say I have multiple left feet and feel self-conscious, one new year’s party I dragged my dancing partner into a log fire as I tripped over my feet! Got a nasty burn too! So why have I been painting dancing lovelies over the last few months? I think something is telling me to tackle my fears, the unknown and look twice at what I have rejected. Or maybe the universe is telling it is now my time to dance in the light? Lose my inhibitions and go for it! So my word for 2014 is Dance (like nobody is watching!). Hi Sharon!!! love this piece!!! Wishing you a Healthy, Happy and very creative New Year 2014!!! As usual Sharon your use of exciting colour and humour shines through. Happy new year, may you dance through the months ahead with joy! Just lovely, happy new year Sharon!